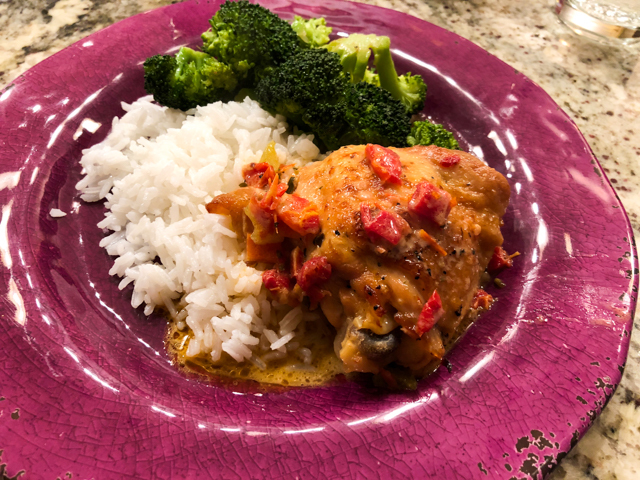 This recipe, made in the pressure cooker (or Instant-Pot) brings chicken thighs to the table in less than 30 minutes, but they will give that impression of comfort food that your Mom (or Grandma) cooked for you slowly and lovingly for hours. Since the skin suffers some abuse in the pressure cooker environment, I go through the extra step of crisping up the skin under the broiler, just a few minutes of added work, for a big pay-off. Six chicken thighs fit nicely in our pressure cooker and provide dinner with benefits (aka leftovers). Season chicken pieces with salt and pepper. Add oil to the pressure cooker, heat until almost smoking, add the chicken, skin side down, and saute until golden. Flip the pieces and saute on the other side for a couple of minutes. If necessary, do it in two batches so that the chicken will fry, not steam. Reserve the chicken in a platter, covered with aluminum foil. Discard the extra fat accumulated, keeping about one tablespoon in the pan. Sautee celery and onion (if using), seasoning lightly with salt and pepper. When they get translucent and fragrant, add the chicken stock, whipping cream, sun-dried tomatoes, herbes de Provence, and a little more salt. Whisk, making sure the stuff glued to the bottom of the pan gets incorporated in the liquid. Add the chicken pieces back into the pan, trying to leave the skin poking over the liquid. Close the pressure cooker and bring to maximal pressure. Cook for 25 minutes, release pressure, open the pan. Remove the chicken and run the pieces under the broiler. If you like, reduce the sauce by simmering on the top of the stove as the chicken broils. Serve the chicken with the sauce around it. Comments: If you want to make the sauce smoother, simply transfer to a food processor and get all those bits of sun-dried tomato incorporated in it. I would probably do that if serving it for guests, but for a weeknight dinner, rustic is perfect. I love the texture of chicken thighs cooked under pressure, and by crisping up the skin I get the best of both worlds. A little rice, my favorite quick broccoli dish, and dinner is taken care of! Interesting recipe I’ll certainly try as love sun-dried tomatoes and do not use them enough! Note only two of the usual battuto ingredients used . . . shall also copy. So many friends have bought and are ‘raving’ about the Instapot that must really leave the bygone ages and get one for myself even if my sparse kitchen surfaces will complain 🙂 ! I love my pressure cooker, but that comes with being Brazilian… every single home in Brazil has at least one! I have another PC recipe (not politically correct, I am not into that) coming up on the blog tomorrow – this time of the year the pressure cooker comes to play often! Oh Sally, this is a wonderful recipe. It has the flavor of a dish that was braised for hours. A very South of France flavor. So easy to make. super easy! I do like to simplify dinner preps on weeknights, and this was perfect! You are making my mouth water! Looks wonderful and yet another use for my electric pressure cooker. 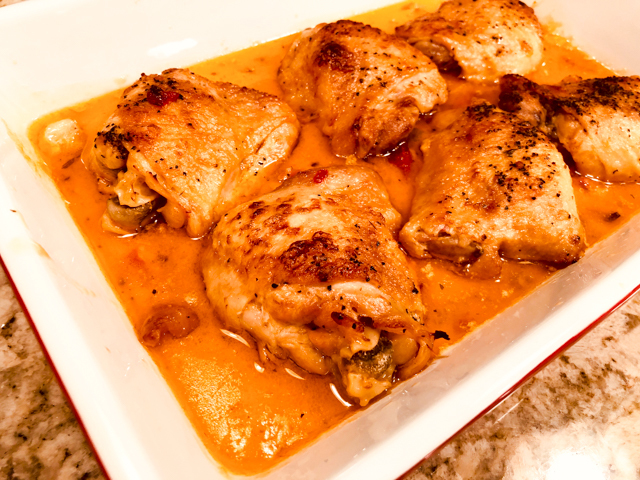 stay tuned for one more recipe popping up tomorrow… again using poultry, very tasty!